One of the biggest mistakes I’ve seen in business is managers not establishing a routine daily team meeting. The benefits are basic but the risks of not holding routine meetings can be catastrophic. The daily team meeting has one major purpose; to align the team. Many things can happen during the daily course of business and keeping teams informed allows them to adjust their priorities and schedules according to events and changing company needs. Another benefit is that when information is shared, team members can also share their experiences and insight. This is an important point that many managers – specially those that do not have the hands-on expertise like some individuals on their teams – fail to take advantage of. Another critical benefit of the daily team meeting is that it gives team members a ‘guaranteed’ opportunity to meet with their boss and bring up or escalate any issues critical to them executing their tasks. Most managers don’t realize that in the course of the day, their schedules will not converge well with their teams, and thus the opportunity to communicate diminishes. (TIP: a good indicator that you may not be easily accessible to your team is the number of emails you receive from them). 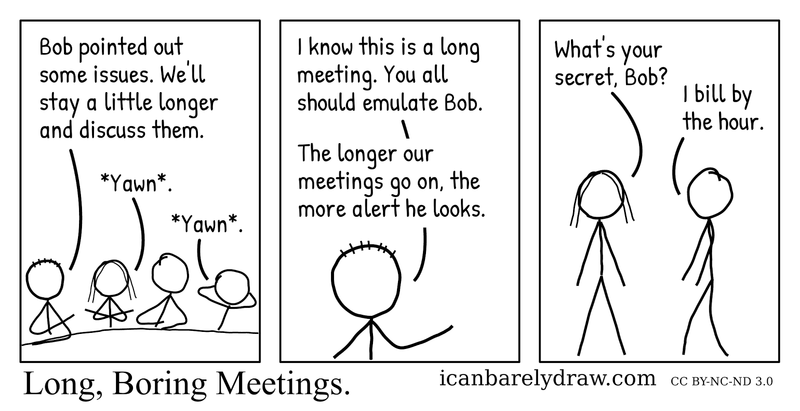 Risks of not holding a daily meeting can be countless. Not aligning teams typically results in teams working inefficiently, completing tasks that may no longer be critical, and failing to react to new urgent needs. Studies show that productivity increases when employees have aligned goals and not communicating with them consistently allows mis-alignment of goals and consequently a reduction in productivity. In a worse case scenario, not having daily meetings could even prevent members of the team from receiving safety-relevant information. Setting up 15 minute team meeting should be reasonably easy. The operative word here is “15-minutes”. 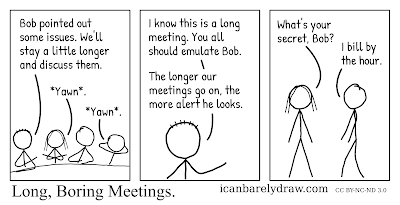 Individuals are typically busy; setting up daily update meetings that consume too much time may prompt individuals to stop attending regularly or not share information openly. Meetings can be held in common work areas, meeting rooms, and in case not all team members are on-site, daily conference calls will do the trick. Posted on Thursday, May 07, 2015 by George R.
I've personally experienced the benefits you're describing above-great read! One thing I'd add to the suggestion - try, if at all possible, to make it a literal "stand-up" meeting. People seem to better summarize talking points and feel more action-oriented when standing.